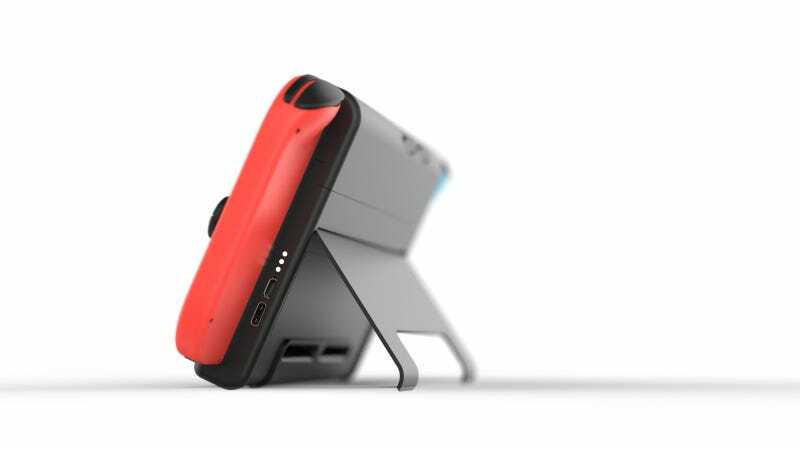 InDemand Design’s SwitchCharge gives Nintendo’s new console a stronger stand, onboard cartridge storage and promises up to an additional 12 hours of portable battery life, but the coolest thing it does is move the Switch’s charging port from the bottom to the side. Playing the Switch in tabletop mode without third-party enhancements can be a bit of a pain. The flimsy tablet kickstand only offers one angle of view, and unless you get creative with props or buy a plastic stand, you can’t really plug in a USB charger. It’s a small problem now, that’ll get bigger once the Switch gets some streaming video services. The SwitchCharge, currently enjoying a successful IndieGoGo campaign and due to ship out in August, solves the bottom charging problem handily. Inside the lower portion of the case is a plug, much like the one inside the Nintendo Switch dock. That plug gives the Switch access to the case’s 12,000 mAh battery, also allowing the tablet portion to be played and charged through the USB port on the side of the SwitchCharge unit. Just a simple pass-through, but it makes a world of difference. I also love the little cartridge slots in the top of the unit. Knowing my propensity for losing little card-like things, I’ve been playing whatever’s in my Switch at the time. I’ve seen a lot of Switch accessories since the system launched last month. The SwitchCharge is the first one that really feels like it has the potential to significantly enhance the Switch experience. Of course this is an IndieGoGo crowdfunded dealio, so we’ve not gotten a chance to test the unit out. It looks like it could solve a lot of Switch issues, but there’s always a chance it could also, say, make it explode. InDemand Design is looking for a pledge of $85 to get one when they launch in August, but I wouldn’t worry too much. Considering the reception the SwitchCharge has gotten so far, I wouldn’t be surprised if they wound up in stores everywhere before the year is out.